Keep a record of which staff are on the premises for security purposes with these In/ Out boards that can be taken from the wall and carried to a safe area in the event of a site roll call. A clear visual indication of which staff are on site. Cardboard inserts to show employee names, supplied in a strip so they may be printed. Simple press to slide mechanism shows IN or OUT. 3 sizes available 10 / 20 and 40 names. 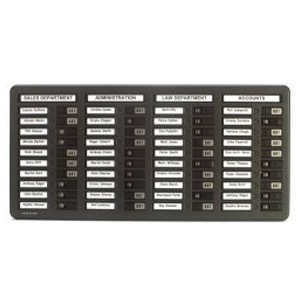 Attractive and solid, this board is ideal for all industrial and office environments. Plastic frame can be wiped clean if required. Comes complete with fixing kit including screws and wall plugs. The 40 name panal is 360mm (Tall) x 732mm (Wide).